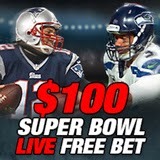 Intertops Sportsbook always sees plenty of interest in its wide range of Super Bowl props, and this year is no exception. Among the most popular markets is first touchdown scorer, with Seattle Seahawks' Marshawn Lynch (+550) and Rob Gronkowski of the New England Patriots (+650) leading the way. Other popular selections include Julian Edelman and LaGarrette Blount (both +1000) and Brandon LaFell and Doug Baldwin (both +1200). All odds are subject to change. You can choose from almost 100 different prematch props this year, including the coin-toss, MVP and more, while you can get odds of -175 that the team scoring first wins the game ad +370 on there being a two-point conversion. It's the biggest game on the sporting calendar, and Intertops Sportsbook is treating it as such with a selection of props like no other. In addition to the pre-game options, if you want to bet in play Intertops has a great free bet promotion. A $100 matched bet is on offer if you take advantage of the live betting markets (terms and conditions apply). With game day just around the corner, sports fans from all around the world are making up their mind on who to back for Super Bowl XLIX, and the Patriots are narrow favorites to stop Seattle going back-to-back. But with so many different props at Intertops Sportsbook, why leave it there?